This post is by Richard Knott, Regional Director, APAC, for Celtra and co-founder of Puzzle Creative Technology Solutions. He is also the Chair of the IAB Mobile Advertising Council in Australia. There are 3 main levers to drive results in digital advertising – media, data and creative. The media lever, typically controlled by a DSP, enables you to optimise media schedules and placements based upon audience, environment, response and price. The data lever is currently managed by DMPs, linking data and knowledge to audiences and outcomes. Finally, creative, historically the most important lever to illustrate, engage and persuade, has unfortunately been excluded from any kind of scalable, integrated, management system, that could drive mastery of this lever in the digital world. This disconnection, or somewhat “offline” treatment of digital creative, has not only meant creative has become a bit of an afterthought in digital, it also means data typically can’t touch it and therefore ends up only empowering the media decisioning, never the creative decisioning. At best, data only provides some last-gasp optimisation option through DCO (Dynamic Creative Optimisation) or A/B testing. The opportunities for data in creative far exceed the typical DCO style of whether a ‘purple call to action has a better response rate than an orange one’. DCO has some value in the ecosystem, but it is extremely limited. It is akin to being presented with your choice of M&M rather than your choice from an entire confectionary store. Hence the differences driven are often underwhelming. 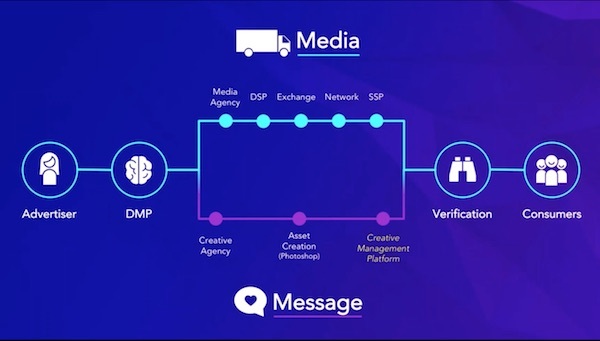 CMPs or Creative Management Platforms have risen out of the old Ad Builder and Ad Server world to provide a centralised management tool to make, manage, measure & master digital creative. A crucial difference when reviewing CMPs, versus reviewing DSPs or DMPs, is you need to not only assess features, but ensure that two hugely significant baseline provisos must have been met by the CMP. One, you have to be able to make whatever you want. It has to be fully functional across rich html, animation, and the multiple forms of video. These CMPs must not limit creativity in any way through limited functionality, formats or products. Otherwise it is completely understandable, however tragic, that you might feel the need to revert back to using developers and stand-alone executions to get what you need. This would defeat the whole purpose of the consolidation within a CMP. Two, you must be able to deliver and execute that creative wherever you want. The CMP must not limit where you can execute your creative solution through a lack of certification or capability. Individual publishers and other media will always enforce some limitations and particular nuances of style (e.g. Snapchat only accepts vertical-orientation video) that will require tailoring of a solution. However, every CMP must be able to execute to the fullest extent, within those particular publisher requirements, everywhere that you wish to buy an ad. A CMP should always be able to execute something on any publisher. Build in one place, execute in every place, has to be the baseline motto for every serious CMP. Once you know your creativity won’t be limited and your creative platform won’t be defining your media plan through its limitations, then you are ready to start benefiting from this new and exciting tool. Not least, the enablement of data. Enabling data in creative can take a number of forms. Loosely, these can be bundled as manual, audience, contextual and reactive. There is a lot of cross-over here, but this is a decent place to start. AI is beginning to sneak in as well, as its own form of data in creative, but right now, with most banner ads still looking like it’s 1994, let’s not run before we can walk! Manual data is where creative is defined through some human-controlled decisioning. For example, “what is the price today”, “what is the product that needs pushing right now”, what does some extraneous influence require us to do, etc. Typically these are changed by operations teams, through some kind of API fed sheet. This avoids the need for operations people to venture into the actual creative to make changes. Something most designers would love to avoid! Good examples of this type of data use are price promotion campaigns for catalogue based advertisers, supermarkets and airlines. Audience data is a segmented categorisation of demographic variables and these variations should be huge. For 25 year olds in Toowoomba, you should be serving not only different creatives, but different products and formats than you are serving to 55 year olds in Chatswood. Also, 25 year olds in Toowoomba who own their own home, should get a different execution from those who still live at home. The amount of variation here has typically been limited based upon the practicality (and cost) of creating all of these versions. However, CMPs enable a layer principle to creative where all possible components and assets of a creative are loaded into the one creative, with an appropriate data-trigger assigned to each. The platform then stitches together the correct variant based upon those data triggers being met. Thereby enabling thousands of variants out of one creative build. Good examples here include automotive manufacturers wanting to promote the different features of a car to different audiences, and banks who may wish to promote different product offerings to customers. Contextual data is often overlooked, which is a mistake as it can be incredibly effective. Where is the consumer now? What day is it? What time is it? What is the weather like? What is the language they prefer to be spoken to in? You can send that 55 year old in Chatswood a general 55 year old ad to try and persuade them to book a flight, but it can be much more effective to serve them a day-specific call to action, bemoaning the weather, with details of the nearest travel agent, all in their preferred language of Cantonese. Reactive data can be broken down into many types, but to keep it simple this kind of data is informing the creative based upon optimisations recommended after you understand more about how a campaign is going. Again, a rudimentary form of this is DCO, but it can be full A/B/Z testing that changes entire formats, designs, even concepts. The problem of “dumb” creative is everywhere and a solution now exists – so why isn’t everyone doing this? Firstly, it is quite new. Secondly, as always, the early adopters are doing this. These are mostly, and unsurprisingly, those whose businesses are reliant on digital and the new economy. They typically don’t have heritage processes and workflows, with their vested interests and self-serving opinions. They need to be nimble to maximise their current growth curves as they strive for maturity. For those more traditional businesses, there are a few, like Unilever, that are becoming fully vested in this as a strategy, but even with them, it took a significant amount of time and effort to overcome heritage processes and residual intransigence. Pulling the creative lever in digital could be the hardest lever to pull. Media agencies saw what was coming in media and jumped into digital and programmatic trading with two feet and are reaping the rewards now. It wasn’t easy, but those who are winning now, laid the foundations of their success a long time ago. 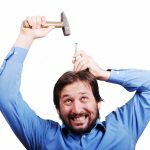 The data lever was entirely new and incremental to current processes, so the pain was often minimised. However, for some, for those who didn’t squeeze DMPs more fundamentally into their processes, the truth is their DMPs aren’t driving huge benefits as they sit there like some kind of data repository without much in the way of actionable outcomes… yet. The creative lever could be the lever that truly enables data into marketing communication. The vision is data informing all the way from CRM to any customer communication touchpoint, be that advertising or others; informing the media, model & message. The creative lever is the hardest to pull because it sits within the most vested process in advertising, and one that shows very little self-motivation to change. The journey you have to go on requires significant investment, but far more in time and effort, than money. Therefore it is unrealistic to think, unless you are a nimble digital economy brand, that you can just licence a CMP and away you go. 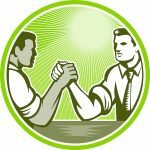 It’s unlikely everything and everyone will fall into place after a couple of meetings and training sessions. It may require not just the licence, but a period where you hire partners that can act like training wheels, to help you learn, test, improve and perfect. Someone to interface with all of the relevant parties to simply make it work as it should. Then, that stabilising party should begin to extract its way out of the process. However this will all take time. Which is all the more reason to start now.